About a week ago, my friend asked me to go to dinner with her. I wasn’t really in the mood for going out that night, plus I was surprisingly still full from my lunch that afternoon. But when she told me she wanted to go to Jules Bistro, I quickly changed my mind. 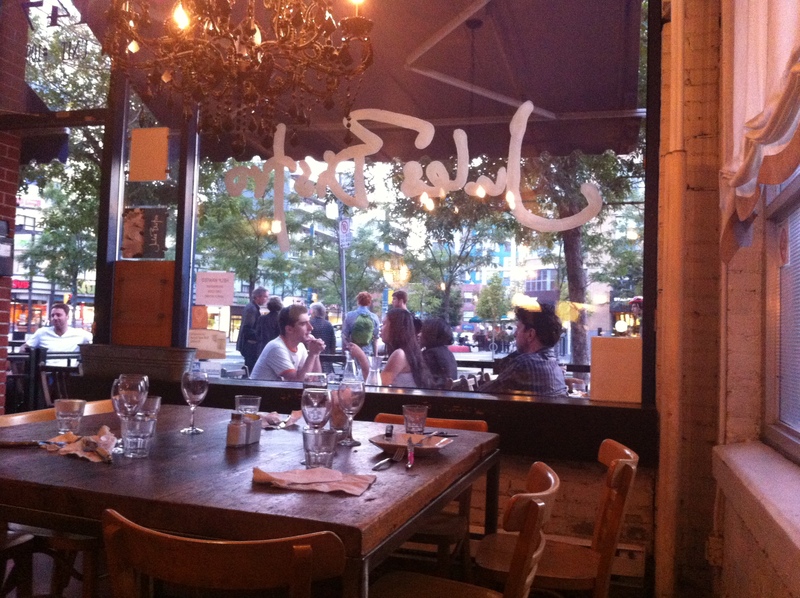 Jules is a French restaurant, located in the trendy Queen and Spadina area. I’d been to Jules twice before. Each time, my taste buds thoroughly enjoyed themselves. A creature of habit, I feasted on mostly the same meal I had had before. That being said, Jules has a wide variety of dishes to choose from. And unlike many other restaurants in Toronto, they offer a prix fixe menu all year round. At an affordable price of $24.95 for 3 courses, it’s really a value for your money. 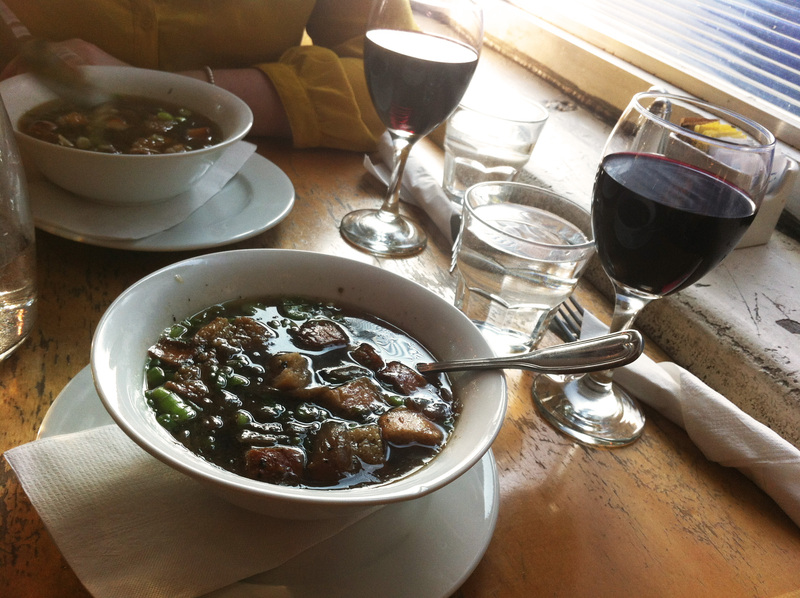 I typically order the chèvre chaud to start, but this time I went with the soupe a l’oignon, or onion soup. I definitely needed something light to start off with. The veggie broth did the trick, with oversized breadcrumbs to add that extra flavour and texture. 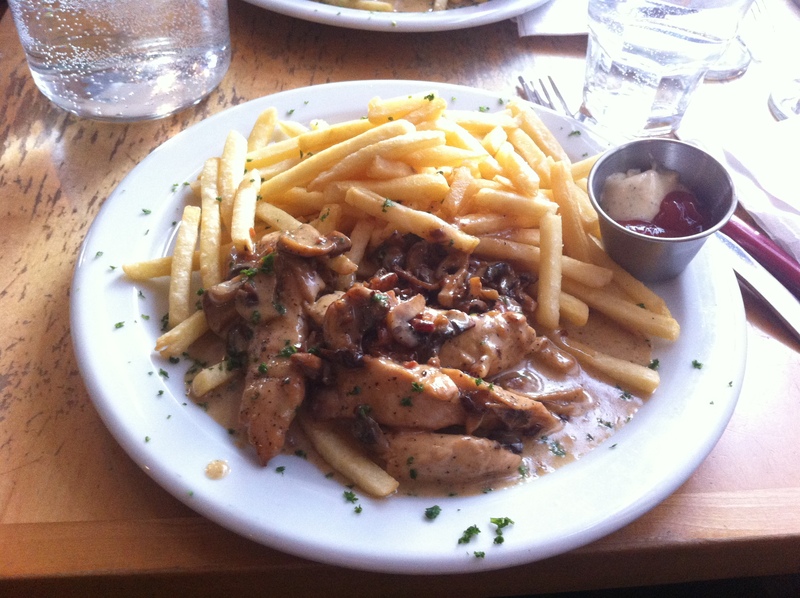 Next was the main dish – sauté de poulet with frites. This plate is SO DAMN TASTY! Oh my gosh, the cream sauce is to die for! It’s so rich, with mushrooms and bacon drizzled in. The dish comes with ketchup and another sauce for the fries, but I always slather them in the cream sauce before eating. And I make sure to not leave a single drop behind! 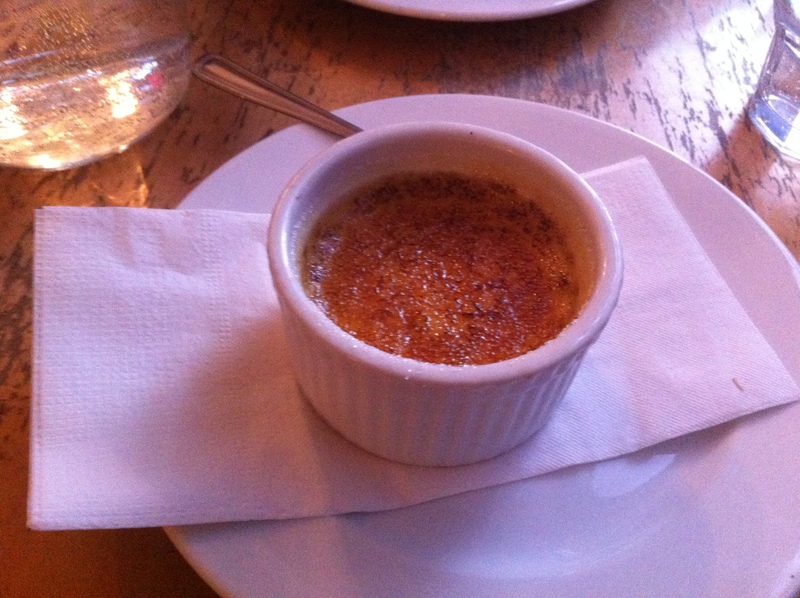 If crème brule is on the menu, I always order it, and this trip was no exception. You really can’t go wrong with crème brule. The candied texture of the top part, the creamy consistency of the middle … it’s all just so delectable. And crème brule always reminds me of the custard my mom used to make back in the 80s, very nostalgic. 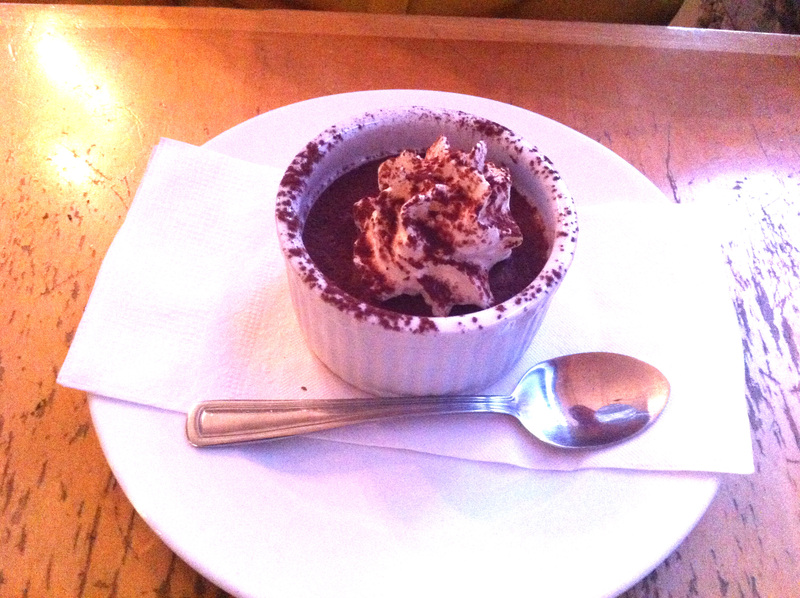 My BFF ordered chocolate mousse for her dessert. 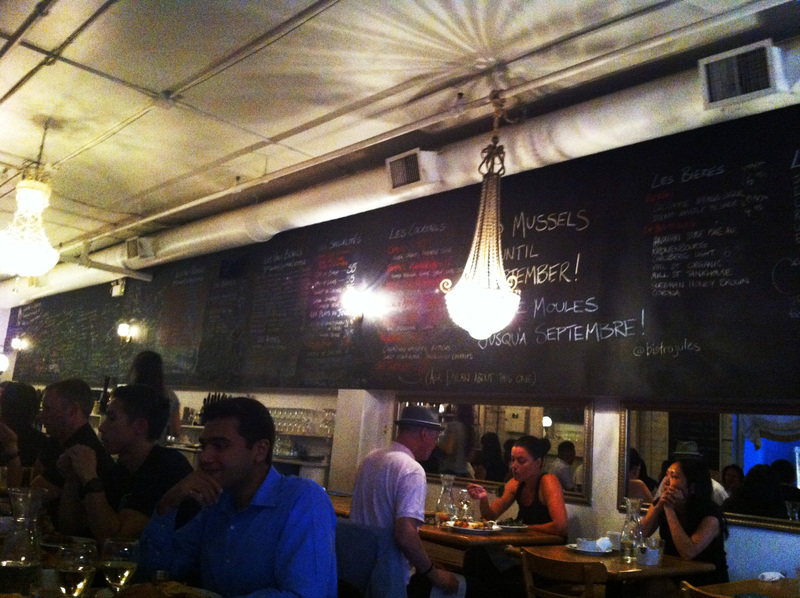 Jules Bistro hits the mark on all fronts – the great Queen & Spadina location, the impeccable culinary delights, the affordable price tag, the bistro ambiance … I could go on. I highly recommend this restaurant. And with the Toronto film festival around the corner, and this restaurant around the corner from all the action, Jules should be on your resto hit list this September and beyond.